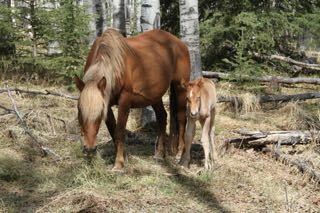 For all our volunteers and visitors you will be happy to see that today Blondie has finally produced her foal, a little colt. We know that many wondered if she was ever going to foal especially given the size of her. 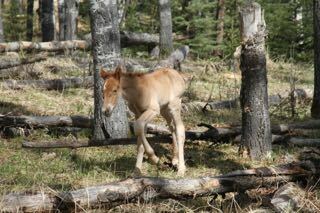 We would like to introduce you to the little colt we’ve named “Stryker”, strikingly beautiful! Like any new foal it was extremely wobbly when it first started to move and we held our breath many times when we thought he might fall over one of the logs. It won’t be long before he will be able to race around like his cousin, “April,” who is growing stronger every day. We got great enjoyment out of watching little “April” put on a show as she raced around the waterer over and over again. Yahoo – on the fly! Our other little “Angel” who was born to “Princess” is also getting stronger each day and has become quite a character. Often times she investigates the three young boys in the next pen. She also comes right up to us humans to see what we are doing in her pen. 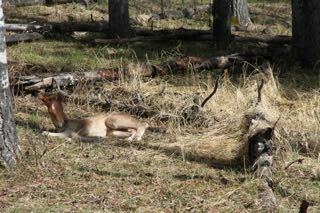 The beautiful “Princess” allows us to have close contact with her and her baby as long as there is feed involved! I like to run too! During the day we open their pen and allow them to wander down the alleyway to visit all the other horses. “Angel” takes this opportunity to race about as fast as she can. Mom just doesn’t care as she just does her own thing. There are two more mares we expect to foal soon. We believe “Queenie” one of our rescued mares should foal imminently. The other wildie mare, “Belle” well, we just don’t know. Springtime and babies . . . just a joy! They are all so beautiful…one of the reasons I love spring so much! And this Spring has such beautiful babies pictured above! 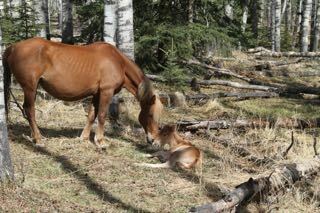 So glad Blondie finally had her foal! He reminds me so much of Lucky when she was a baby. Welcome to the world little ones…we hope it is kind to you!